Is there a medical term to describe my uncontrollable urge to get new skincare because the ingredients are just way too good? Please give me a yes because I do not wish to be branded as a shopaholic. Full disclaimer: I am not a fan of Forest Essentials. When they first opened their doors in Kolkata, I lost all control and jumped with joy. Picked from the stores whatever my two eyes saw only to later realize that their products do not contain the full ingredients list (most of them still don't) and they just smell good. That’s it. They sell beautiful fragrances - I love Nargis (and recommend this to everyone! ), and my grandma is a fan of Madurai Jasmine. But, when it comes to skincare, I turn my blind eye. Until I saw Rasa and Tejal - they have the full ingredients list and do not have fancy fragrance. On top of it, the ingredient list is impressive. Is this FE upgrading for good? I had to support this so, these two come home with me. I was interested in buying only Rasa but they were like Tejal is the 'balancing' water, and I felt like what if Rasa also turns out to be a dud like the other FE products? If I use it without Tejal, I will not be able to say anything! 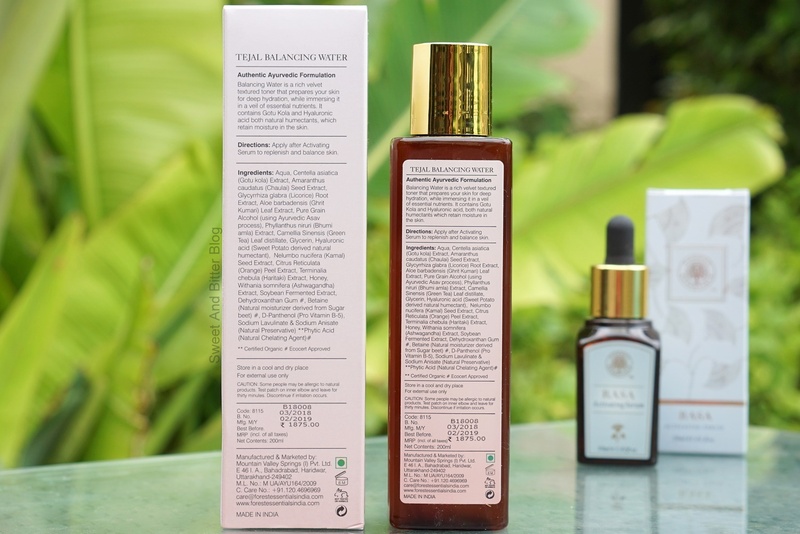 The serum goes first followed by the toner. 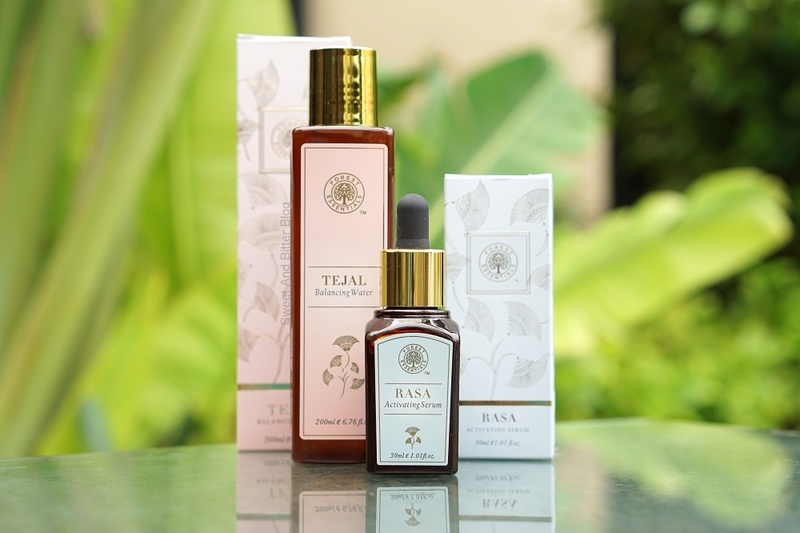 First, apply Rasa and when it is almost absorbed by your skin, apply Tejal to balance. 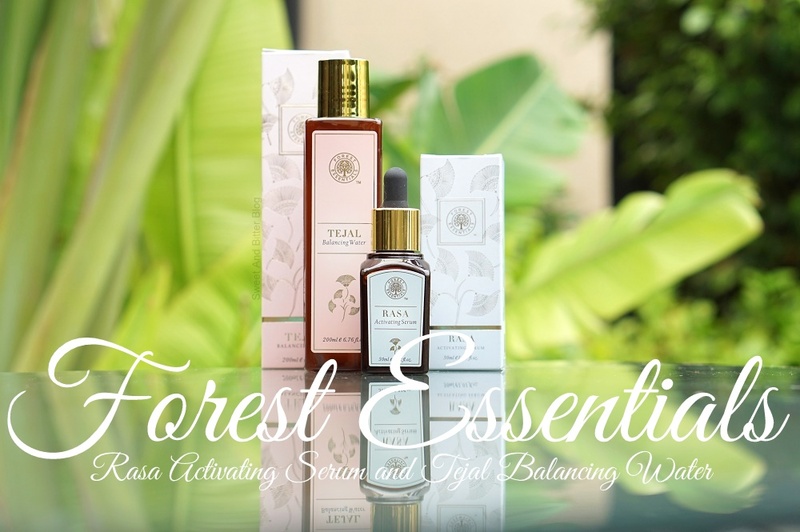 Forest Essentials Rasa Activating Serum (Rs 2790 for 30ml): It is not a serum. It is an essence. Packed with good ingredients (that got me drooling) in a water base. So, this will work for all skin types. No oily or sticky feeling after use. This watery solution gets absorbed quickly. There are no peeling or any other issues that generally comes with most water-based essence/serum with botanical ingredients. The best time to use this is in the morning, but I used it at night majorly. 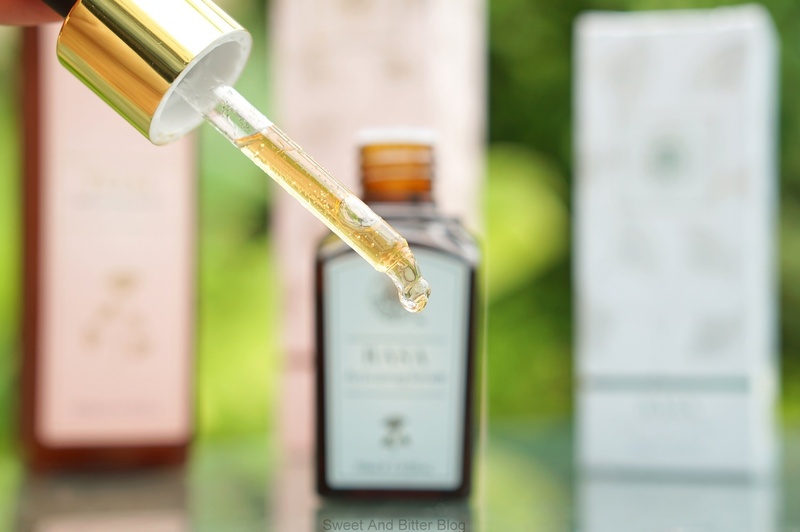 Right after using Pixi Glow toner, Rasa feels like refreshing nourishment for my skin. Forest Essentials Tejal Balancing Water (Rs 1875 for 200ml): Bit thicker than usual toner, Tejal is a water-based oil-free toner. 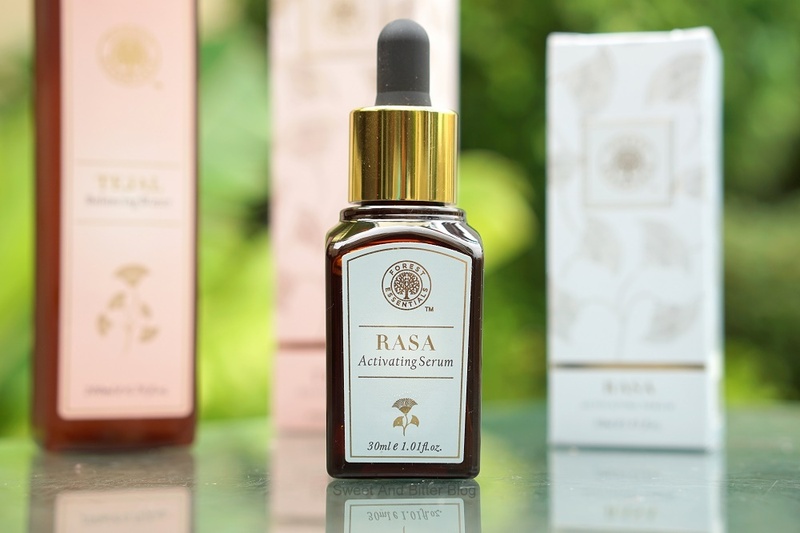 This toner follows the Rasa serum. This one will surely last longer than the Rasa bottle. Again, I loved the fact that there is no stickiness or oily feeling here. Very soothing and calming with little to no fragrance. Overall: I loved both Rasa and Tejal. I used them while I was using Pixi Glow and also a month before I started Pixi Glow. 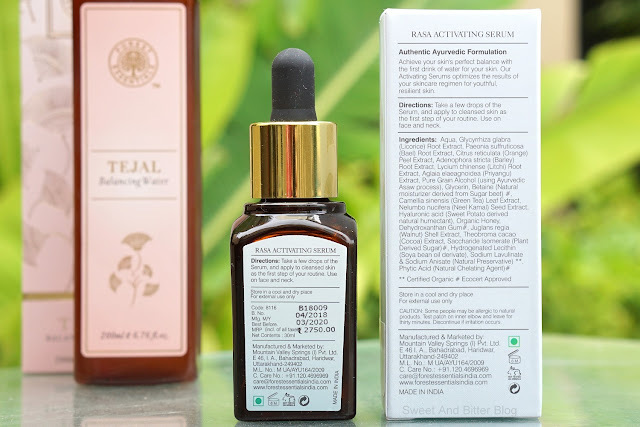 I saw the most prominent change while I was using it with Pixi Glow so, this one is not as effective in giving a glowing skin as they advertise but overall it is the nice product to nourish your skin with right ingredients. If money if not a matter then go ahead and get Rasa to use under your moisturizer right after you wash your skin in the morning. 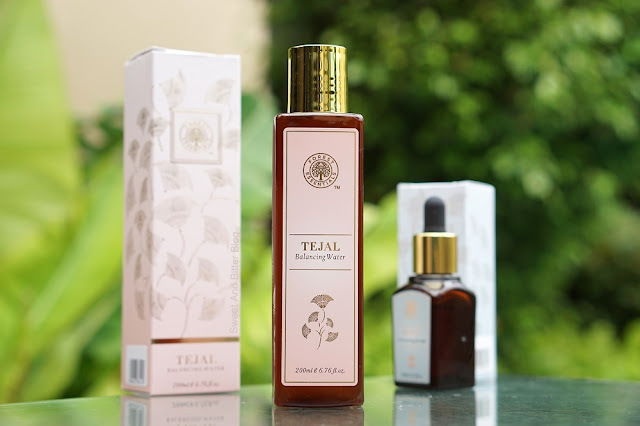 If you are ready to splurge then get Tejal as well. This has no slippery feel, and you can confidently wear makeup on top. Is there anything in the market that competes with this? To my knowledge - no. Do I recommend? Conditional yes - only if you are looking for an added nourishing step to your daily routine that does not take time to seep-in to your skin and is chemical free AND you are ready to spend. But, will I repurchase? Probably not.